It’s the 23rd of December and Christmas is very nearly here! Today we reveal the next window in our gorgeous BB Advent Calendar. 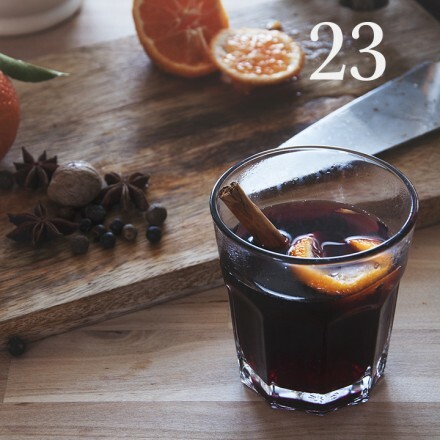 Today we reveal our seasonal mulled wine recipe, the perfect festive drink to enjoy with loved ones on Christmas day. You can follow our easy how-to video to make it at home or if you’re out getting those last minute gifts, pop into any of our brasseries for a cup of delicious mulled wine and take a break from the busiest shopping day of the year! Just visit our recipe page for this and many other stunning recipes. Tag us on facebook, instagram or twitter with the results of any of our recipes that you try. You can also share pictures of any other festive adventures you are having, whether it’s wrapping up your gifts or celebrating the party season with friends & family. Just tag us using the #bbadvent and we will enter you into a weekly prize draw to win some exciting prizes including some of our beautifully designed bespoke Christmas crackers, our gorgeous charity Christmas cards, and Brasserie Blanc gift cards to be spent in the New Year.